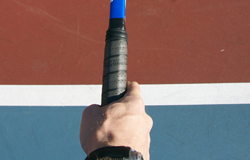 This grip is optimal for one type of serve and that is the kick serve. 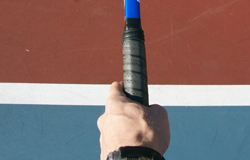 The grip is also used to hit twisted serves but we recommend the mid-way grip for the twisted serve. Limitations: when serving the flat and slice serve! The reasons for that: A round swing pattern becomes more natural with this grip instead of “hitting through the ball” when contact is made. Learn The Golden Five Check Points in The Swing Path for More Power – click here! 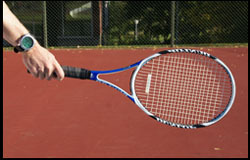 Used mainly for volleys, serves, overheads, the backhand slice and defensive strokes. 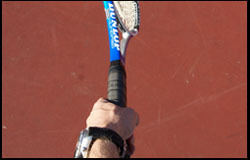 The continental grip can be used for both forehands and backhands, but it’s rarely used anymore for forehands, because it’s poorly suited to hitting topspin. 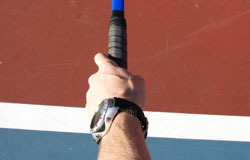 It was a popular grip until the early 1970s, when the US Open and the Australian Open stopped playing on grass and left only Wimbledon to be dominated by the low bounces for which continental grips are best adapted. Since the racquet face is relatively square on a continental grip, for ground strokes the strike zone is low and to the side of the body. Thats why its helpful for defensive shots, low balls, and wide balls that youre late on. 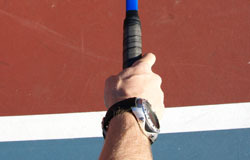 -One of the negatives to using this grip for your forehand is that it is very difficult to generate topspin upon the ball. 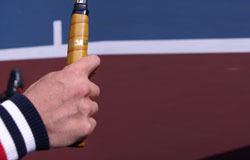 I can only see one professional player playing with this grip and that is John McEnroe, he is playing with the continental grip on both the forehand and the backhand side. Another play is Stefan Edberg as also were using the continental grip on his forehand. Sometimes his hand even went over to the eastern backhand side when he was playing forehands, this is not very rare. How To Make Twisted Serves – click here! The more closed racquet face, the higher and farther in front of your body your strike zone should be for proper contact. Since the racquet face is relatively square on a Continental grip, for ground strokes the strike zone is low and to the side of the body. Thats why its helpful for defensive shots, low balls and wide balls that you´re late on. 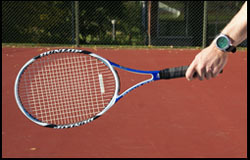 - easy to handle low balls, defensive shots, wide balls that you´re late on also called the running forehand. 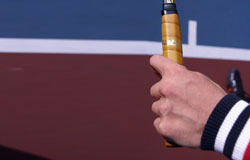 I can only see one professional player playing with this grip and that is John McEnroe, he is playing with the continental grip on both the forehand and the backhand. Stefan Edberg was also one player using the continental grip on his forehand and he even sometimes used the eastern backhand when he was playing forehands, this is vary rare. 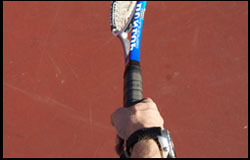 Want To Learn The Modern Forehand Topspin?